Ot Azoy: our Yiddish course has expanded to be held at 5 levels, we have the addition of Yuri Vedenyapin from Harvard joining our Yiddish faculty this year to add to a compliment of some of the world’s best Yiddish teachers. 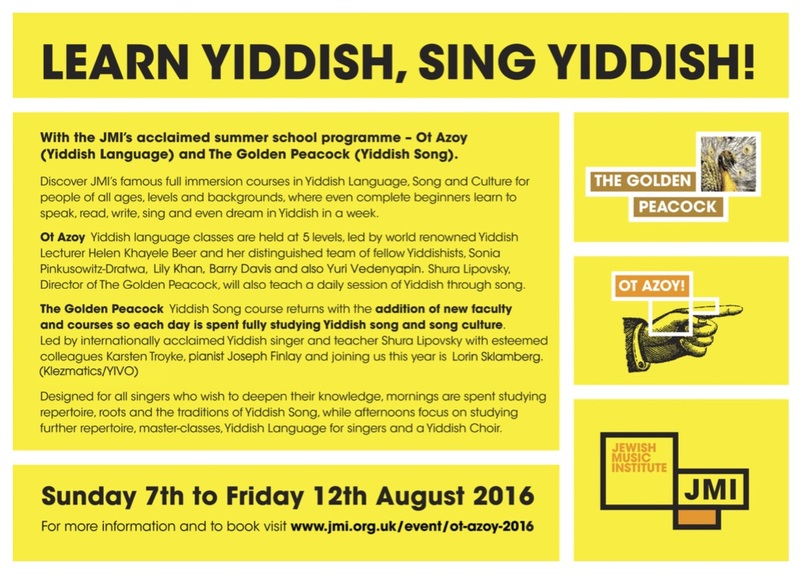 Golden Peacock: our Yiddish Song Course is back again this August with Shura Lipovsky, Lorin Sklamberg, Karsten Troyke, Rachel Weston and with the addition of Joseph Finlay as accompanist. Immerse yourself in 6 days of Yiddish song, learning repertoire, singing in the choir, learning new insights and performing to the fellow students and the public. Klezfest 2016: After a very successful relaunch of Klezfest last summer, this summer we are back with even more faculty. The faculty is led by Ilana Cravitz (London Klezmer Quartet) who will be joined by Alan Bern (Yiddish Summer Weimar and Brave Old World), Frank London (Klezmatics), Merlin Shepherd (Sklamberg and the Shepherds) as well as a stellar line up of some of the best UK Klezmoriim in the UK, Susi Evans, Guy Schalom, Francesca Ter-Berg with more to be announced.